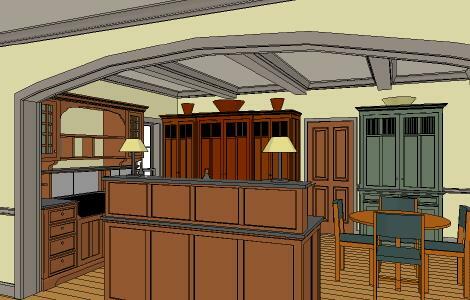 The following article graphically shows some Kitchen Design Ideas for Medium to Large sized kitchens that are furnished with our Workstations. A Picture is worth a thousand words, and this is especially true when trying to describe a furnished kitchen. 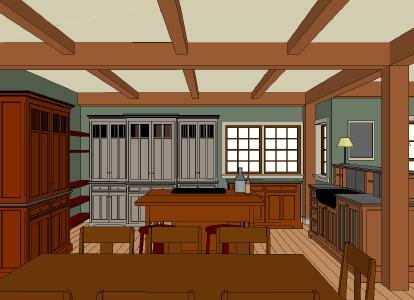 The images show the locations and sizes of our Kitchen Workstation Furniture (KWF), but do not show the actual features of the individual pieces. The YesterTec Designer’s catalog is required to select the style, wood type, stain or paint colors, door and drawer styles, countertop materials, interior options, etc. Once the layout is approved, the pieces are styled and priced from the pre-priced choices in the designer’s catalog and the design phase is done. Simple…Fast…Fun. Door to the left of the range leads to the pantry/ laundry room/garage.The shallower depth, shorter height and different color of the two C32 cupboards flanking the PR36-FP Refrigerator/ Pantry allow the larger refrigerator to become a focal point. The following images show how Kitchen Workstations can be used to complement an exposed stainless steel range. 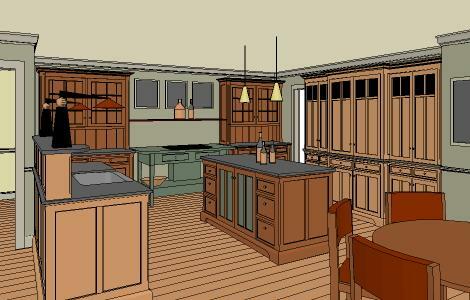 This 7 piece kitchen includes a commercial range as its focal point. 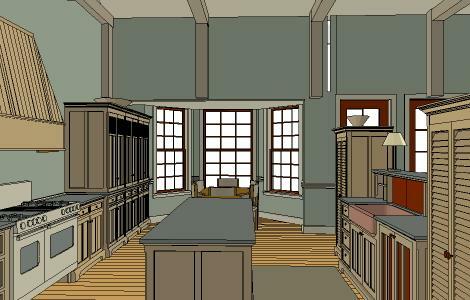 The flanking cupboards help maintain the furnished character of the open plan. The main sink workstation island separates the range from the breakfast table. A DO40-OM to the left of the prep sink (under the window) provides an additional concealed oven and microwave. The refrigerator/pantry on the left includes (2) 12″ deep full height flanking pantries. 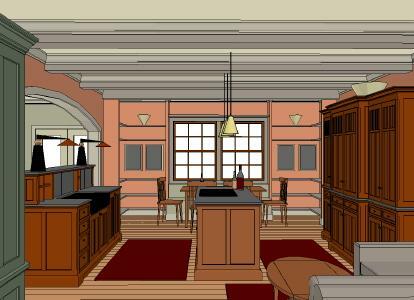 This Great Room/Kitchen features an island/ Sink workstation flanked by two freestanding High-Boy units. Same kitchen as the above image, the commercial look stainless range is flanked by two B48 base units. The island is a 6′ long base unit. The large armoire includes (2) Subzero 700 tall units and a full height pantry. 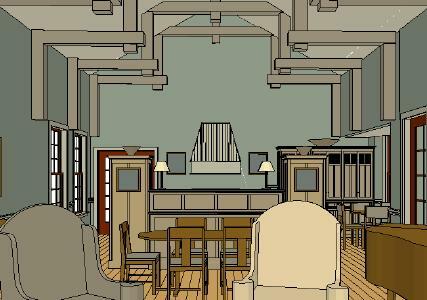 The following examples show how multiple designs can be created for the same or similar floor plans. This shows the versatility of the KWF concept. Though it is not a stainless range, this example shows how KWF can work with any freestanding range. Here the range is flanked with 18″ base and top units, with a wood covered hood piece between the top units. Though the sink is anchored under the window, the other 3 major workstations are interchangeable, producing multiple design options for this room. This open-plan furnished kitchen uses two closet pantries to reduce the need for more workstations. 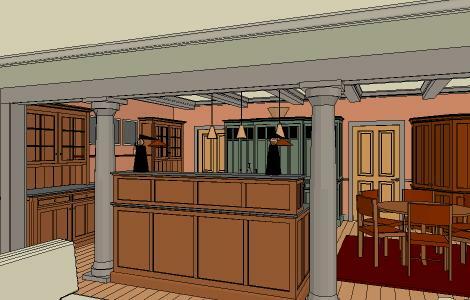 Only the columns and beam separate the open kitchen from the adjacent room. Here in the same space, minus the beam and columns, the furniture is re-arranged so thatthe messy countertops can’t be seen from the living room, only from the dining area. The two closet pantries have been replaced by two cupboards flanking the cooktop and the ovens. nnA Subzero 700 refrigerator, an oven and microwave and a full-height pantry are combined in the large armoire. 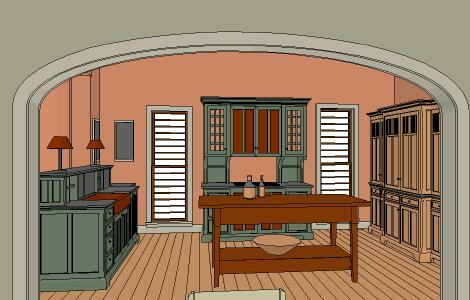 A different view of the same kitchen as shown above (without the trimmed opening to the living room) reveals a cooktop with a downdraft vent installed in a Work Table. The island includes a concealed oven. This kitchen is open to the living room in a large suburban home. The door ahead goes to the laundry room and then to the garage. A small seating area is located to the right of the breakfast table. 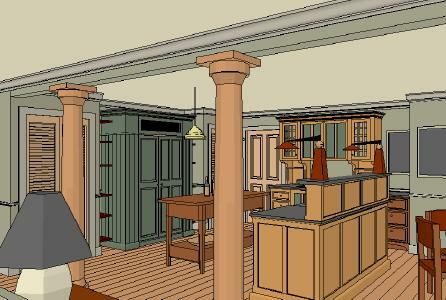 Same home as above, this design features columns flanking the sink workstation. 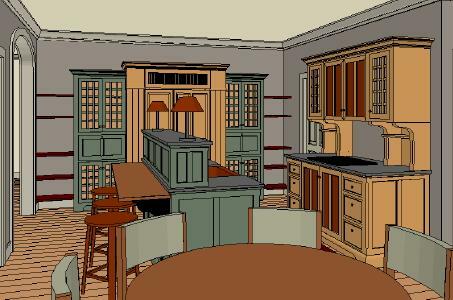 A corner Working Pantry conceals a baking/food prep center. 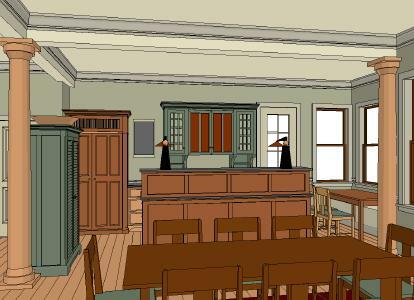 Same room as above, this design is a Library/Kitchen. A window seat completes the table and chairs that are flanked by floor to ceiling book shelves. The table is used for study and dining. The green corner desk (barely visible in the left foreground) is a concealed computer desk with a TV that can be viewed from the seating area on the right. The island range includes a downdraft vented cooktop. 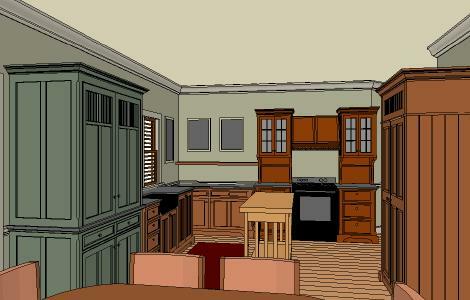 This kitchen features 3 major pieces and 3 smaller ones. Two Work Tables increase the work surfaces while lightening the look of the kitchen. 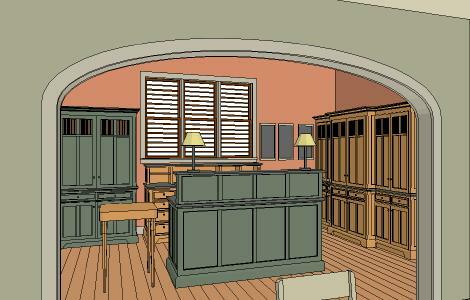 The C32 cupboard in the corner is shorter and less deep than the two flanking workstations. The large armoire contains the refrigerators and a full height pantry. The sink provides a visual barrier to the family room. 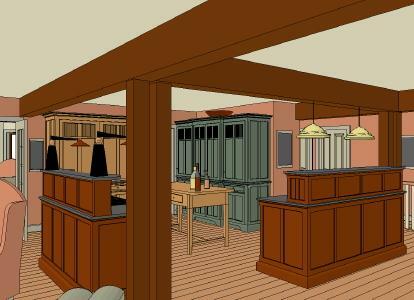 Here, an Ox Blood Working Pantry is added and the large armoire conceals the ovens and refrigerators. The island contains a downdraft cooktop. This open plan home features (2) High Boys that eliminate the need for top cabinets flanking the Sink island workstation. 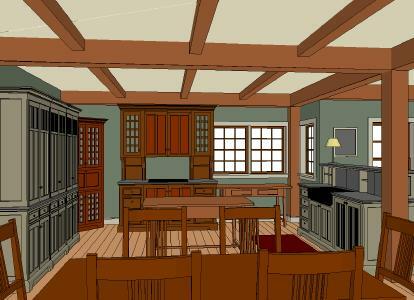 This design eliminates the two High Boys and substitutes a Pantry Pie Safe in a more open plan kitchen. Wall colors have changed as well. 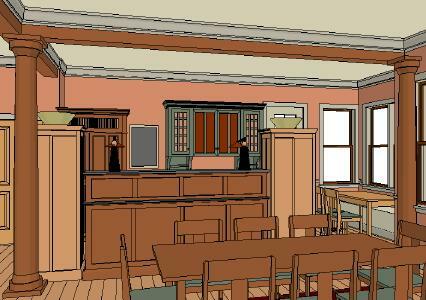 The primary view windows to the lake are through the family room to the left of the island sink workstation and the dining room is in the foreground. The large armoire on the right conceals 2 ovens, a pantry and a Subzero 700 refrig/freezer. The range conceals the GE Advantium micro/oven/hood above the cooktop. In the center is a Type B worktable. Here, the cooktop, sink and messy counter tops are concealed from the dining room(foreground), and more open to the family room on the left. Notice the different window over the sink from the previous design. The working pantry to the left of the sink conceals all the small appliances. The green cooktop island features a downdraft gas cooktop. 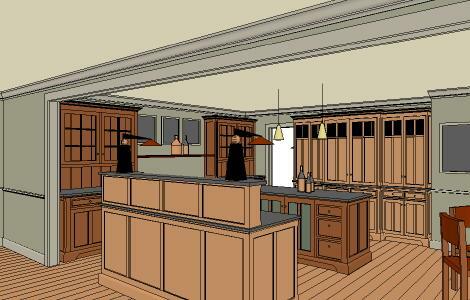 This family room/ kitchen (with breakfast nook to the left) features 5 workstations including our largest corner Working Pantry and a Work Table with a plate rack above it on the left. 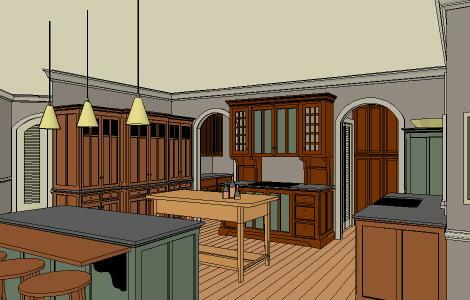 This very large kitchen includes a butler’s pantry and a storage pantry each shown beyond the arched openings. 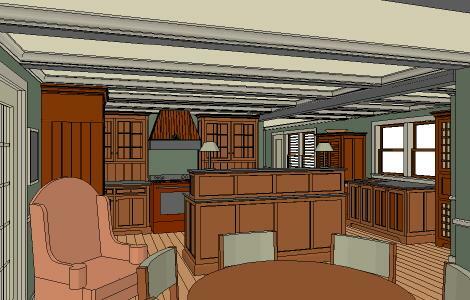 In the kitchen there are 6 workstations open to the breakfast/family room beyond. 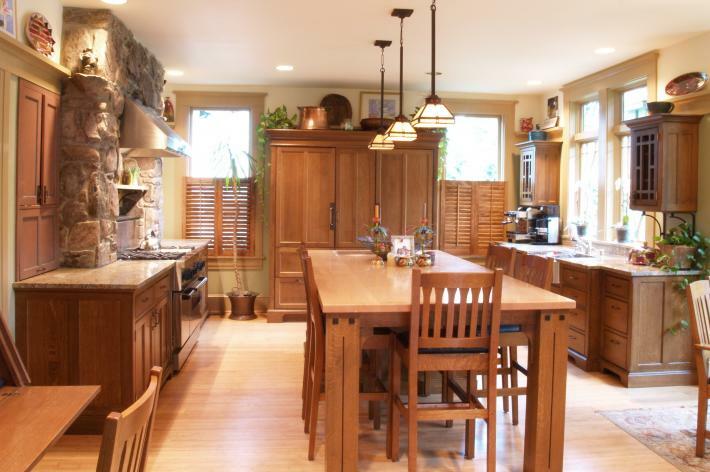 This log home kitchen/breakfast room is open to the living room as well. Seeing the logs between the individual pieces allow many colors and textures to be compatible in the same design. 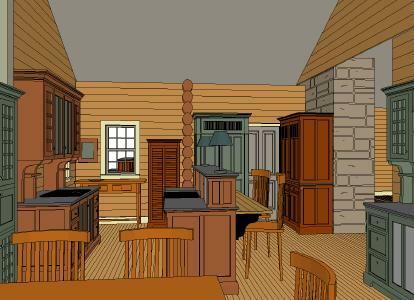 This open plan kitchen includes a pine working pantry and a green refrigerator/oven/pantry armoire. 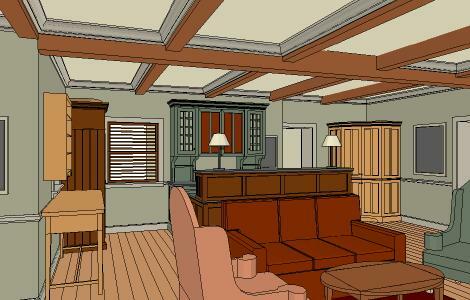 The islands and their upper storage pieces hide the messy counter tops from the living and dining areas.